The war lasted only two years but mobilized two field marshals and 25,000 soldiers. The country was put to fire and sword with violence on both sides. 24 July – Assassination of father du Chayla at Pont-de-Monvert by a small troop led Abraham Mazel and Esprit Séguier. 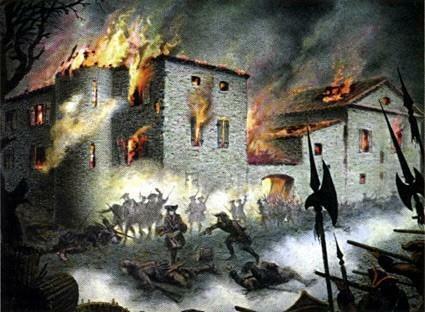 Then murder of two parish priests and an entire Catholic family at la Devèze castle. 11 September- first severe fighting between camisards and royal troops at Champ-Domergue with lack of clear results. 22 October – battle at Télémac. Gédéon Laporte, the oldest camisard leader, was killed. His head and those of some companions were exhibited at Barre-des Cévennes, Anduze, Saint-Hippolyte and Montpellier. Basville, the administrator of Languedoc, believed the rebellion was overcome. But two new leaders appeared, namely Laporte nicknamed Roland and Jean Cavalier. 24 December – Jean Cavalier routed 700 men from the garnison in Alès with only 70 men. 12 January – Cavalier’s troops were victorious at Val-de-Barre (near Nîmes) and forced Count de Broglie, commander of the royal troops, to retreat. February – the king’s Court became worried and replaced Count de Broglie by field marshal de Montrevel as head of the troops in Languedoc. New troops arrived. 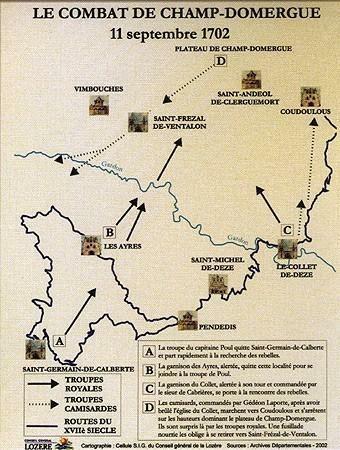 6 March – the camisards were defeated by Montrevel at Pompignan, hope rose again amongst the Catholics. 1 April – Montrevel massacred participants at a secret meeting at Moulin de l’Agau near Nîmes. April – deportation to Perpignan of Mialet and Saumane inhabitants as a result of their eager support of the rebels. Unable to overcome the guerrilla, Montrevel attacked the population that supported it. 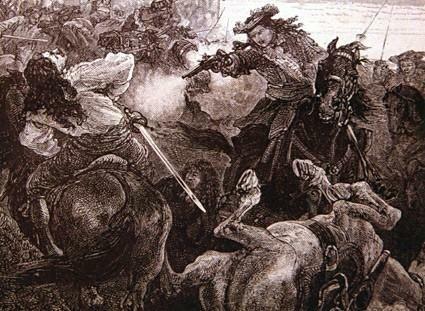 29 April – defeat of Cavalier at Tour de Billot near Alès. September – the camisards attempted to spread the rebellion to the Rouergue region and massacred the Catholic population in Saturargues near Lunel. Autumn – “Burning of the Cévennes”. In order to prevent the population from supporting the rebels, the authorities decided with the king’s permission to devastate the region and rid it of its inhabitants to. Between October and mid-December, 466 villages and hamlets were destroyed by the royal troops led by Brigadier Julien. The population was moved to Catholic areas. The result was contrary to expectation : many Cévennes people joined the camisard troops. As the royal troops had difficulties in restoring order, the Catholics armed partisans. These were called “cadets of the cross” (“cadets de la croix”) or “white camisards” (“camisards blancs”). They massacred and looted, thus increasing the chaos. 15 March – Cavalier’s great victory against a Marine regiment in the plain of Devois de Martignargues (Vézenobres county). Late March – as a result of his failures, field marshal de Montrevel was replaced by field marshal de Villars. 16 April – before his departure, de Montrevel inflicted a severe defeat upon Cavalier at Nages (Sommières county). 19 April – royal troops discovered Cavalier’s secret storage of food and ammunition in caves at Euzet. 20 April – Villars arrived and suggested negotiations. May – Villars and Cavalier started negotiating. The latter accepted unconditional surrender. 13 August – Rolland died at the castle of Castelnau-les-Valence. October – the main camisard leaders surrendered and left France.